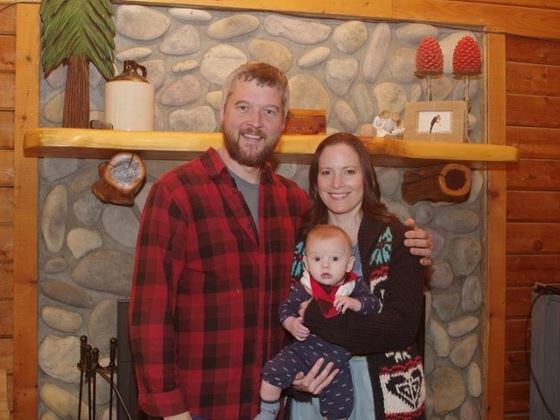 Dr. Cory Marvin C. Papenfuss, his wife, Carmen, and their son Benjamin. 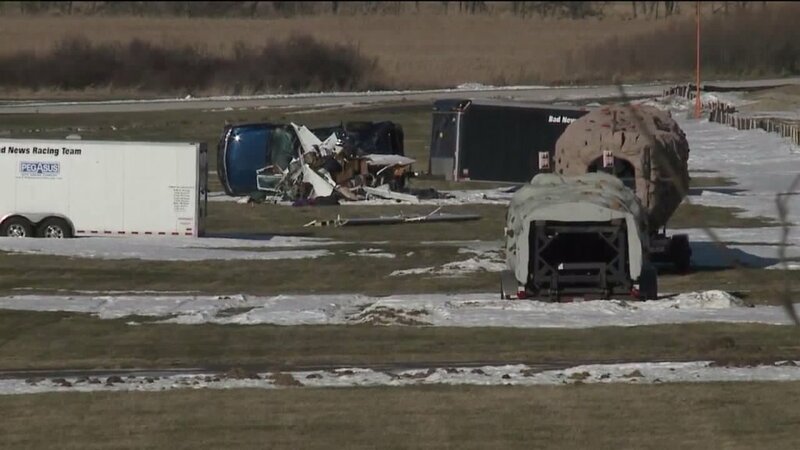 On January 4, 2017, about 1208 central standard time, an experimental, amateur-built BD-4 airplane, N311SD, sustained substantial damage during a runway excursion and subsequent impact with a parked vehicle while attempting to take off from Capitol Airport (02C), Brookfield, Wisconsin. The private pilot was fatally injured. One passenger received serious injuries; an additional passenger was not injured. The pilot owned and was operating the airplane under the provisions of Title 14 Code of Federal Regulations Part 91. Visual meteorological conditions prevailed at the time of the accident, and an instrument flight rules flight plan was filed but not opened for the personal flight, which was destined for New River Valley Airport (PSK), Dublin, Virginia. The pilot's wife reported that she and her 6-month-old son waited inside airport office while the pilot loaded the bags onto the airplane and conducted a preflight inspection. She then helped the pilot push the airplane out of the hangar. The infant was buckled into a car seat that was secured in the left rear seat, and she sat in the right rear seat with her seat belt on. After the pilot completed his inspection, he boarded the airplane and buckled his seat belt. After engine start, he taxied the airplane to the runway 21 and performed a run-up, checking the flight controls and engine power; there were no anomalies. The wife reported that he properly deflected the ailerons for the wind conditions and applied full engine power while holding the brakes. He then released the brakes and the airplane began its takeoff roll. She could not see over the nose of the tailwheel-equipped airplane, but she felt it depart the ground then quickly settle back onto the runway; she assumed that the pilot was aborting the takeoff. She stated that the airplane became airborne again as the pilot applied more right rudder to maintain the runway centerline. She stated, "I felt us unnaturally veer left and thought 'more right rudder.'" The airplane turned farther left and veered off the runway. She reported that the pilot was "vigorously pumping the rudders back and forth (left and right). It was at this time everything went black." The airplane subsequently impacted a parked sport utility vehicle (SUV), which rolled over onto its side upon impact. A witness reported that the pilot was in and out of the airport office while preparing for the flight. He stated that the wind condition was "pretty obvious with the wind sock being straight out," but that the pilot did not specifically mention the wind. Although the witness could not see the airplane when it started its takeoff roll, when it came into view, it appeared that the airplane was "having difficulty." The nose was slightly up, the right wing was down, and the tail was "oscillating." He stated that the airplane never got more than 10 ft in the air after it drifted off the runway surface. He watched the airplane for 3 to 5 seconds before it went out of sight; the impact occurred about 2 seconds later. The pilot, age 41, held a private pilot certificate with ratings for airplane single-engine land and instrument airplane. 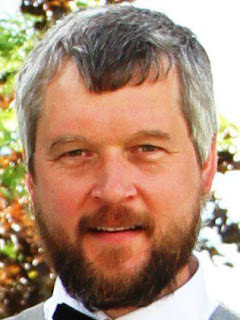 His most recent Federal Aviation Administration (FAA) third-class airman medical certificate was issued on February 26, 2013, with no restrictions. Review of the pilot's logbook indicated that he had about 1,241 total hours of flight experience, with 50 hours in the accident airplane. The pilot's most recent flight review was conducted on December 12, 2015. The pilot and the airplane's co-owner had purchased the airplane in 2015 and started flying it in 2016. The pilot's logbook indicated that he flew 32 flights between April 24, 2016, and November 14, 2016. In the "Remarks, Procedures, Maneuvers" column in the logbook, the pilot mentioned crosswind conditions in 5 of the 32 flights. On May 7, he wrote that he practiced crosswind landings with an instructor pilot. On May 13, he wrote, "MC 1st flight. Takeoff X-W (illegible mark) drift. More cruise test w/pants +10?" On May 20, he wrote, "X-W solo practice (80° off @ 8 kts). On June 22, he mentioned, "Heavy gusting landing – PLOP!" On October 23, he added a remark, "Gusty!" The pilot made numerous entries in the Remarks section concerning airplane performance, such as cruise airspeed tests, stall speeds with and without flaps, Vx (best angle of climb airspeed), Vy (best rate of climb), maximum rate of climb, and a maximum gross weight test flight. He made no entries concerning the airplane's crosswind limitations or stopping distance. The airplane, serial number 11361, was manufactured in 2002. It was a tailwheel-equipped, high-wing cantilever monoplane with a 200-horsepower Lycoming IO-360-A1A reciprocating engine, serial number L-11173-51A. The airplane's last annual condition inspection was completed on September 1, 2016, at a tachometer time of 586.44 hours. The tachometer read 610.99 hours at the accident site. The airplane was equipped with four seats and had a maximum gross weight (MGW) of 2,400 lbs. The empty weight was 1,494 lbs with a useful load of 906 lbs. The combined weight of the pilot and passengers was estimated at 361 lbs. Numerous bags were found in the wreckage and their total weight was 187 lbs; the location of the bags in the airplane during the accident flight could not be determined. The airplane held a total of 80 gallons of fuel. A fuel receipt showed that the pilot purchased 25 gallons of fuel at 02C. It was not determined how much fuel was on the airplane during the accident flight; however, in order to remain within the 2,400-lb MGW limitation, the fuel load could not have exceeded 60 gallons. The distance between 02C and PSK was about 500 nautical miles, which would have required about 30 gallons of fuel. The BD-4 kit builder's website provided aircraft performance information for a BD-4C airplane, which is a newer kit version than the accident airplane. The performance specifications listed on the website indicated that the landing roll distance was 600 ft.
At 1145, the surface weather observation at Waukesha County Airport (UES), Waukesha, Wisconsin, located 4 nm southwest of 02C, included wind from 280° at 20 kts gusting to 28 kts; 10 miles visibility; scattered clouds at 2,200 ft above ground level (agl); temperature -13°C; dew point -18°C; altimeter 29.95 inches of mercury. At 1245, the surface weather observation at UES included wind from 260° at 15 kts gusting to 25 kts; 10 miles visibility; few clouds at 2,200 ft agl; temperature -12°C; dew point -18°C; altimeter 29.94 inches of mercury. The pilot received a preflight weather briefing at 0915 provided by Lockheed Martin Flight Service (LMFS). During the weather briefing, the pilot and the weather briefer discussed the AIRMET Tango valid at 0915, including all the AIRMETs along the intended route of flight, and that current surface observations near the departure airport were VFR. The weather briefer asked if the pilot would like any Terminal Aerodrome Forecasts (TAF), and the accident pilot replied that he had the TAFs. The accident pilot did not request any additional weather information and only requested an abbreviated briefing. 02C is a privately-owned airport and is open to the public. The airport was equipped with three runways; runway 03/21, runway 09/27, and runway 18/36. Runway 03/21, which measured 3,010 ft by 44 ft with a 172-ft displaced threshold, was the only paved runway, and was intersected by runway 09/27 about 1,200 ft from the displaced threshold. 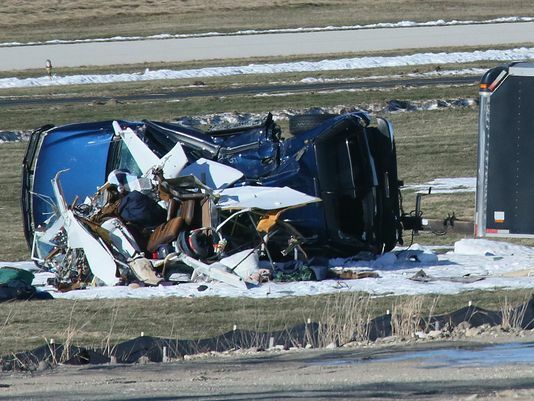 On the day of the accident, FAA inspectors examined the skid marks on the runway, the wheel tracks in the grass between the runway and the taxiway, and the wheel tracks in the grass leading to the aircraft parking ramp where the collision with the vehicle occurred. The total distance from where the skid marks began on the runway to the parked SUV, a Chevrolet Tahoe, was 953 ft. The skid marks were not continuous. About 63 ft of tire skid marks that were veering to the left were found at the intersection of runways 21 and 27. The airplane departed the edge of the runway with no tracks through the snow or grass for about 298 ft on a southerly heading. This was followed by 110 ft of ground movement indicated by tire skid marks on the paved taxiway and tire tracks through the grass. Then there were no tire tracks for 220 ft, and then the tire tracks reappeared and traveled through the grass for 262 ft, to where the airplane impacted the SUV. The impact with the SUV caused it to be displaced about 8 ft and tipped over onto its left side. The airplane's engine, fuselage, and empennage were found on the left side of the SUV. The entire wing separated from the fuselage during impact and came to rest about 91 ft beyond the main wreckage. 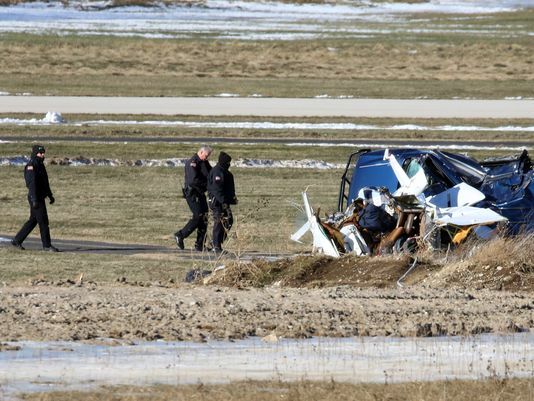 The SUV was parked in an aircraft tie-down area about 250 ft from the runway 21 centerline. Examination of the wreckage after it was recovered to a hangar revealed rudder control cable continuity from the rudder pedals to the control surface. The elevator control tube was connected to the elevator bellcrank, but the control tube was fractured and was not connected to the control stick. The fractures were consistent with overload. The aileron control system did not exhibit continuity, but the fractures were consistent with overload failure. The propeller spinner did not exhibit aft crushing or torque signatures. One of the propeller blades had a leading-edge gouge, span-wise scraping of the cambered surface, and aft bending. The other blade exhibited aft bending but no significant leading-edge nicks or gouges and no chordwise scratching. The Waukesha County Medical Examiner's Office, Waukesha, Wisconsin, conducted an autopsy of the pilot. The cause of death was multiple injuries. The FAA's Bioaeronautical Sciences Research Laboratory, Oklahoma City, Oklahoma, performed toxicological testing on the pilot. No carbon monoxide was detected in the blood. The test for cyanide was not performed. No ethanol was detected in the vitreous. Testing detected 1.808 (µg/ml, µg/g) Ketamine in liver and 0.767 (µg/ml, µg/g) in blood (cardiac); Midazolam in blood (cavity) and in the liver; Morphine in the blood (cavity); 0.492 (µg/mL, µg/g) Norketamine in liver and 0.058 (µg/mL, µg/g) in blood (cavity). Ketamine is an anesthetic, midazolam is a sedating benzodiazepine, and morphine is an opioid pain medication. Review of postaccident treatment records for the pilot revealed that ketamine was administered as part of his initial postaccident medical care. Given that midazolam and morphine are commonly used to sedate patients during medical procedures such as surgery, it is most likely that all of the identified medications were administered during postaccident care. Injuries: 1 Fatal, 1 Serious, 1 Uninjured. On January 4, 2017, about 1208 central standard time, an experimental, amateur-built Demmer BD-4 airplane, N311SD, sustained substantial damage during takeoff when it veered off the left side of runway 21 (3,010 ft by 44 ft, asphalt) at the Capitol Airport (02C), Brookfield, Wisconsin, and impacted a parked vehicle. The pilot was fatally injured; one passenger received serious injuries; and one passenger was not injured. The pilot owned and operated the airplane under the provisions of the 14 Code of Federal Regulations Part 91 as a personal flight. Visual meteorological conditions prevailed at the time of the accident. The flight was departing 02C under visual flight rules (VFR) with New River Valley Airport (PSK), Dublin, Virginia, as the destination. The flight had an instrument flight plan on file, but the pilot had not contacted air traffic control to obtain the clearance. Federal Aviation Administration inspectors examined the airplane and the accident site. 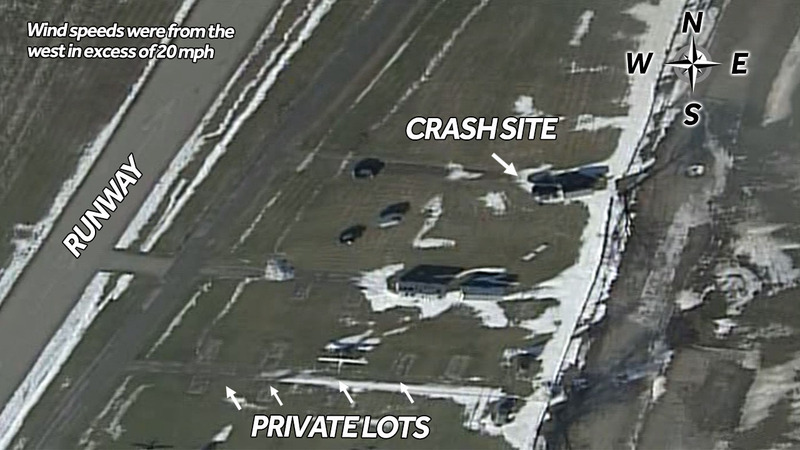 Their examination revealed skid marks on the runway and in the grass leading to the accident site. The total distance from where the skid marks began on the runway to the parked vehicle was 953 ft. The skid marks indicated that the airplane had become airborne momentarily twice before it traveled through the grass for 262 ft and impacted the parked vehicle. The entire wing separated from the fuselage during impact and came to rest 91 ft beyond the parked vehicle. A witness reported that he observed the airplane takeoff and drift downwind (left) of the runway. He saw the airplane became airborne but its altitude was less than 10 ft. He did not observe the crash due to obstacles that limited his view. At 1145, the surface weather observation at the Waukesha County Airport (UES), Waukesha, Wisconsin, located 4 nm southwest of 02C was: wind 280 degrees at 20 kts gusting to 28kts; visibility 10 miles; sky condition scattered clouds at 2,200 ft; temperature -13 degrees C; dew point -18 degrees C; altimeter 29.95 inches of mercury.